During the twentieth century the financial sector became possibly the most regulated area of the economy in many advanced and developing countries. The interwar years represented the defining moment for the escalation of governments' intervention, turning the State into the core of financial systems in its capacity of regulator, supervisor or owner. 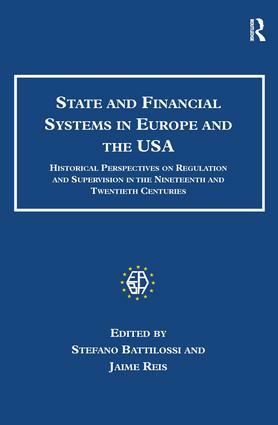 The essays in this collection shed light on different aspects of the experience of financial regulation, ownership and deregulation in Europe and the USA from a secular historical perspective. The volume's chapters explore how the political economy of finance changed in the nineteenth and twentieth centuries and how such changes were related to shifting attitudes towards globalization. They also investigate how regulation responded to governance problems of financial intermediaries and markets, and how different legal frameworks and institutional architectures influenced such response. The collection engages with a set of issues as diverse as they are interrelated across countries and over time: the regulatory attitude of British authorities toward the banking system and the stock exchange market in the nineteenth and twentieth centuries; the comparative evolution of bankruptcy laws and procedures; the link between state, regulation and governance in the evolution of the US and French financial systems; the emergence of banking regulation and supervision by central banks; the regulation and supervision of international financial markets since the 1950s; and the connection between deregulation and banking crises at the end of the past century. Taken as a whole, the chapters offer an intriguing insight into the differing ways western countries approached and responded to the challenges of the international financial system, and the legacy of this on the modern world. In so doing the volume holds up to historical scrutiny the debate as to whether overt state regulation of financial markets always has a negative affect on economic growth, or whether it can be an essential tool for developing nations in their efforts to expand their economies.